Home > > Vehicles > 5730 > 2015 Jeep Wrangler Unlimited Rubicon Sport Utility 4D SOLD!!! 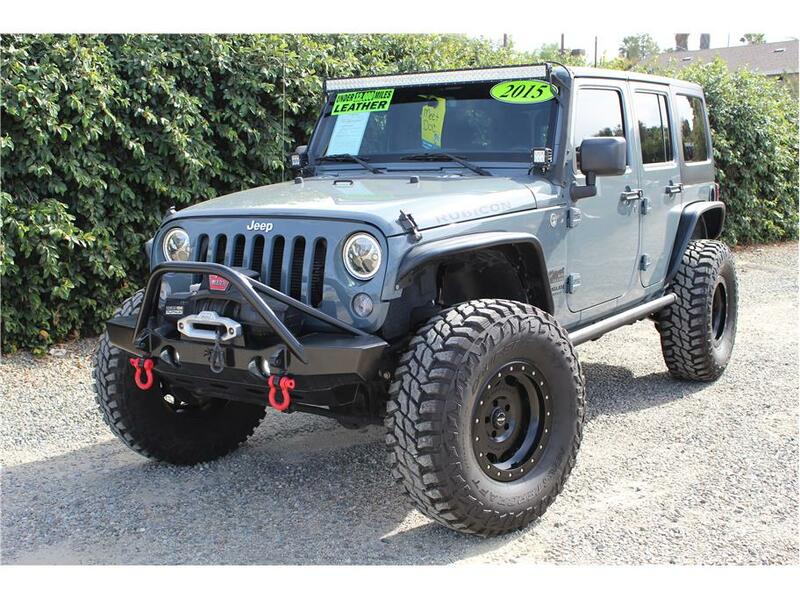 This 2015 Jeep Wrangler Unlimited Rubicon has a V6 3.6L engine and an automatic transmission with only 5k original miles, yes that is not a typo only 5k miles! Our Jeep is ready to tackle any adventure with awesome upgrades like a 3.5 inch Rock Krawler X Factor Mid Arm Kit, Fox 2.0 Shocks, 17 inch Sota Pro Series black wheels wrapped in 37 inch MXT tires, Poison Spyder mid fenders, Poison Spyder Brawler front bumper with a Warn Zeon 10-S Platinum winch, Fox steering stabilizer, Vision X head lights, 52 inch LED light bar with Rigid LED pods, power folding AMP Research steps, Poison Spyder rear bumper and carrier with the license plate relocated in the spare tire, an on board air compressor, custom Katzkin Leather seats on the inside along with a handheld Cobra CB radio. From the factory there is the power convenience group which includes power door locks, power windows, and power mirrors, it also has the Connectivity group which includes Bluetooth, integrated steering wheel stereo controls, which makes it nice to turn up the eight speaker Alpine stereo system, and factory Navigation! Our Anvil Rubicon just went through a complete 151 point inspection and received an oil change service and rotation rebalance of tires and retorqued the suspension. A Jeep in this condition is a once in a life time deal, don’t let it pass you up! Come test drive It today!